When the day finally came to give out the wheelchairs, I could hardly contain myself! I was so excited to be about the Lord’s work. We woke up that morning and headed to Café Verde for our morning java. From there we headed to the distribution area where we had assembled them a couple days prior. 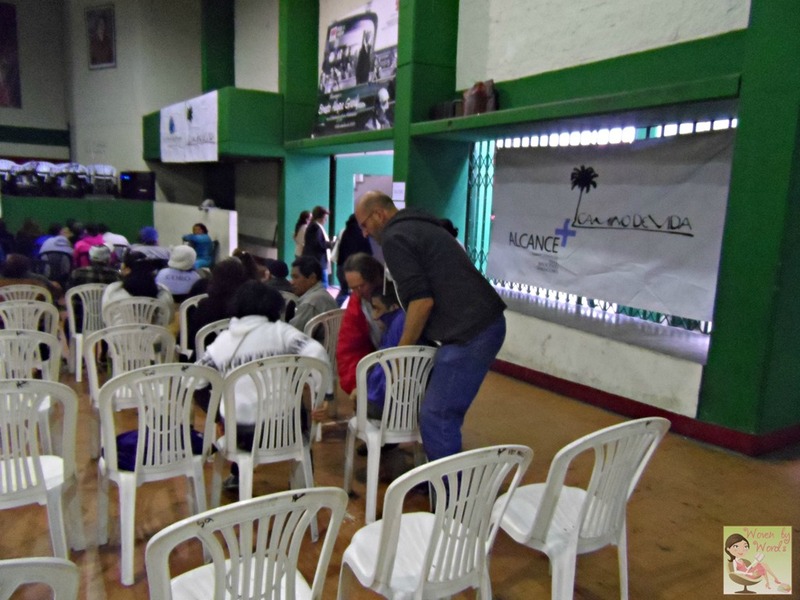 There were stations set up and over a hundred of chairs. One of the mayors of the area had shown up, ready to take pictures and shake hands. It was amazing the number of volunteers who arrived again. We didn’t sit still for long. Soon individuals and families started showing up and taking seats. So many needed to be carried or helped into seats. One of the first people I saw was a man accompanied by who I believe was his mother. Fred and Dave carried this man who had no control over his body. The joy on this mom’s face was amazing. 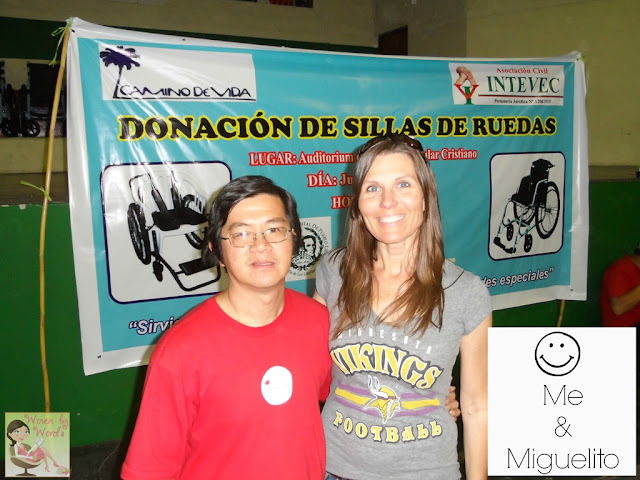 You would imagine, with the life she and her son had lived she might not have much to be joyful over, but he was about to get a wheelchair! A way to get him out of his home. A way to make their world a bit easier! 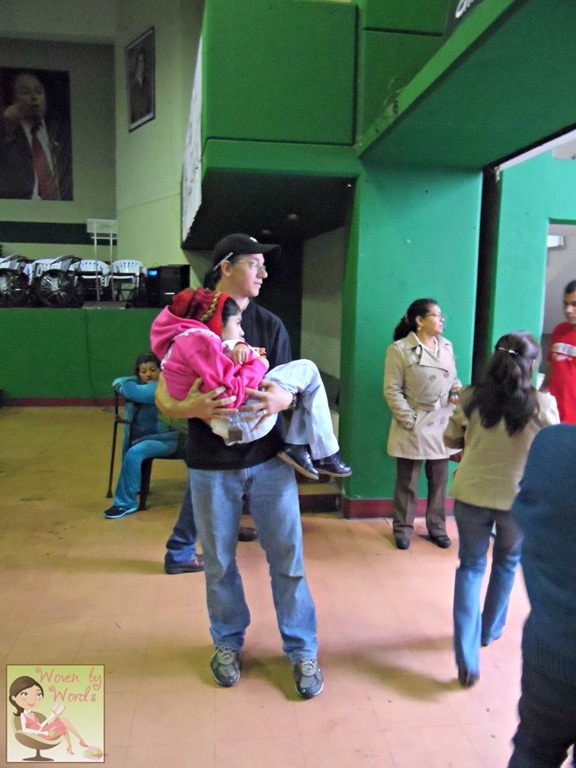 Next I saw Pastor Christian carrying a little girl. The way he held her, it was so beautiful. it was like he was holding a delicate flower and she just laid against him. I could tell there was a connection. He’s the daddy to a little girl with health issues and I could see the love he has for his daughter spilling over to this little girl. 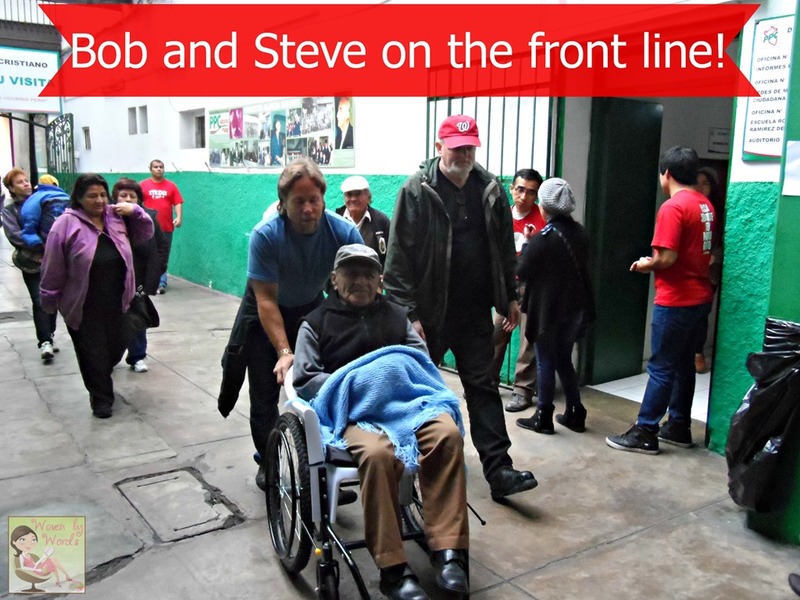 Steve and Bob were stationed like sentries out on the sidewalk by the street with a wheelchair. They just kept bringing person after person into the center! Some people had to be carried off the buses or out of the taxis. I remember Fred saying how this needed to be done last year, but until you’re right in the thick of it, experiencing it, it’s hard to imagine the work you have to do. Once all of the people had arrived, the government part of the work began. We had to get people, in an orderly fashion, from one station to the next. All I wanted to do was be hands on, helping, doing…something. Sweet Fred, in the midst of wanting to do the same thing, was also taking care of me because he knew how much I wanted to do the “work”! He know I’m not a gal who’s afraid of getting dirty or of hard work. In fact, I crave it. When he would see someone needing to be moved, he’d come grab me. He kept watching for any opportunity for me to be helpful. All I wanted to do was be the hands and feet of Jesus! I wanted God to use me in the life/lives of someone else! Well, my opportunities came, and I tell you, it was hard work! And I loved every moment of it. First I got to help Natalia and Nayesha. Nayesha was the daughter and was so peaceful. I got to fit her for the chair that meant making sure her feet were resting on the footpads, Not too high, not too low, just right, Then it was showing them how to put the break on and where the air pump for the wheels was located. Next was Andrea. What a sweet little old lady. 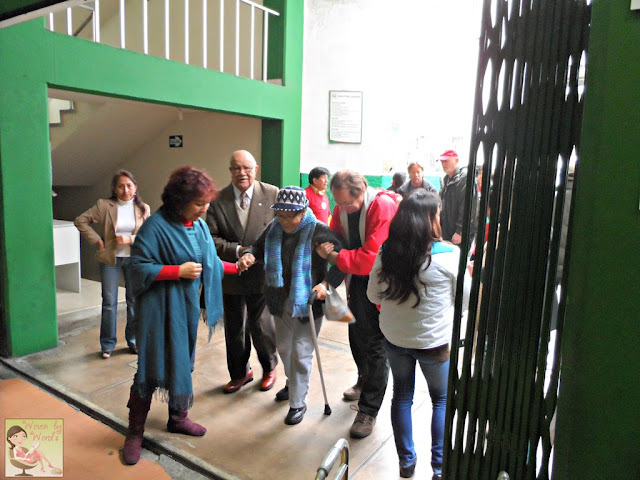 She was there with her daughter who was using canes to walk around. Her mom reminded me of the boys’ great grandma. I told her I wanted to take her home with me and she agreed. =) Again, with her, I made sure to have the foot rests adjusted so she was comfortable. I was sad to have to roll her to get a taxi. There was a little boy who got one of the wheelchairs that had more support and safety. I kind of went into mom mode with him because the shoulder strap for the harness was cutting right across his ear instead of over the shoulder. I figured it would start rubbing him and they might not notice until he had a sore. One lady came in, got into her wheelchair and rolled herself right out. She didn’t want anyone to talk to her, show her anything, adjust the foot rests…nada. 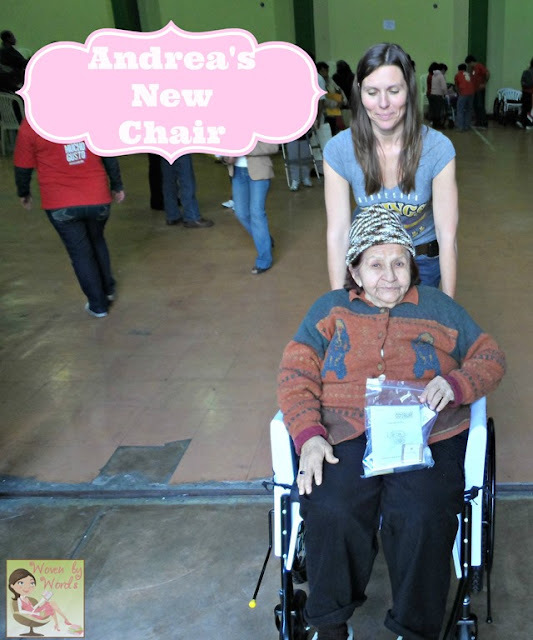 She had no “thank you” for the people who gave her the wheelchair. It actually broke my heart to see how hard hearted she was that she had no thanks for the gift that was being given to her. There was a girl there from another team that we’d worked with a couple times. 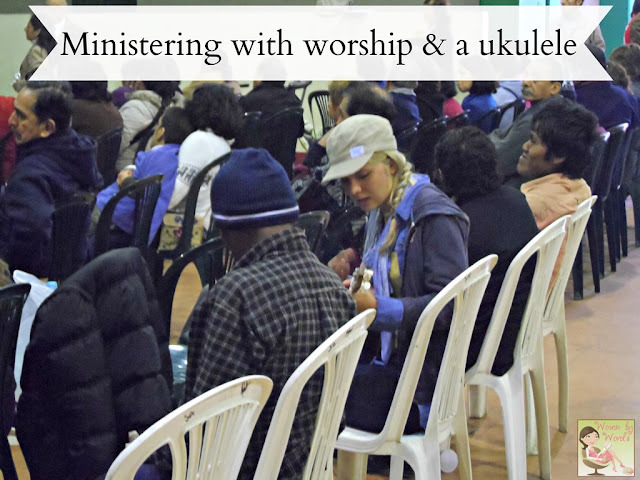 The girl had a ukulele and was singing worship songs. To start with she was singing to one man. Everyone got busy and later in the morning, she was sitting with about 10 people around her smiling and clapping as she sang, “Trading My Sorrows”. I couldn’t help but smile! When it was all said and done, there were 10 wheelchairs left at the distribution center. 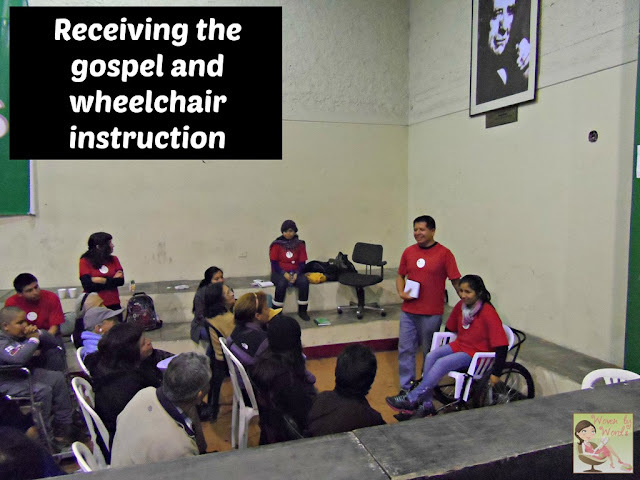 Our team took two wheelchairs to families that weren’t able to physically go to the center. The first was a family with an older mom/grandma. She had broken her hip and was recovering from that. The daughter, who was maybe in her mid-50s had been bitten by a snake and wasn’t sure if she would live. This was the first time I’d heard Pastor Daniel preach. Until then, I thought he was just a volunteer. It was so amazing to hear the passion in his voice. Everything here is temporary. What they’re going through, it doesn’t carry over to heaven. In heaven, their bodies will be new. They won’t have wheelchairs. God has a future in eternity for those who believe in Him. He is the ultimate Healer. He heals souls and that’s where the most important change needs to happen. 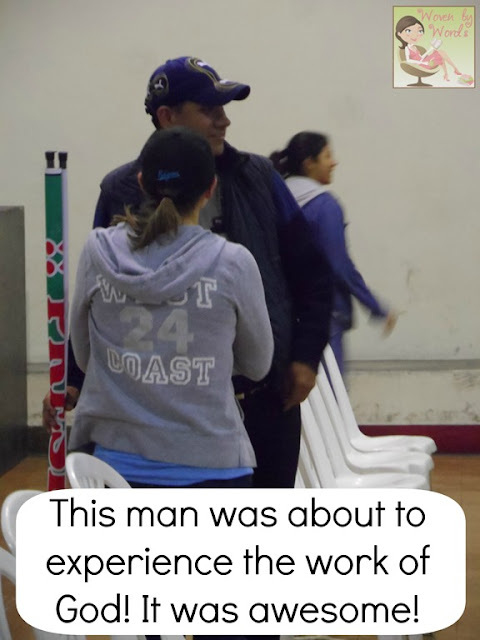 I could’ve listened to him all day…yes, in Spanish and with a translator, and it was amazing! We were able to pray for them and went off to the next “home”. I’m sure they wouldn’t appreciate me putting their home in quotations, I just can’t say enough how their homes and our homes differ. The home was about the size of a spare bedroom. There was a partition, I don’t recall that there was even a door, , that made it almost impossible to get the chair in. They couldn’t move it more because it was hitting the be that the man was laying in. I was only able to peek inside because there was only enough room for a couple of people. We weren’t there for long. As we were standing outside, there was a construction crew unloading a flat bed truck. Bob had the great idea to help them unload the bags of cement. lol Oh my goodness, I stood back and watched because the bags, I already knew, were going to be crazy heavy and wasn’t even going to be something I’d attempt. What a blessing those guys were to the crew! This whole experience, for the first time in my life, had me understanding why Jesus washed the feet of his disciples. To serve and love another like that would be so wonderful! I’m not sure I’ll ever have the chance to wash another person’s feet, but I would be joyful at the opportunity! 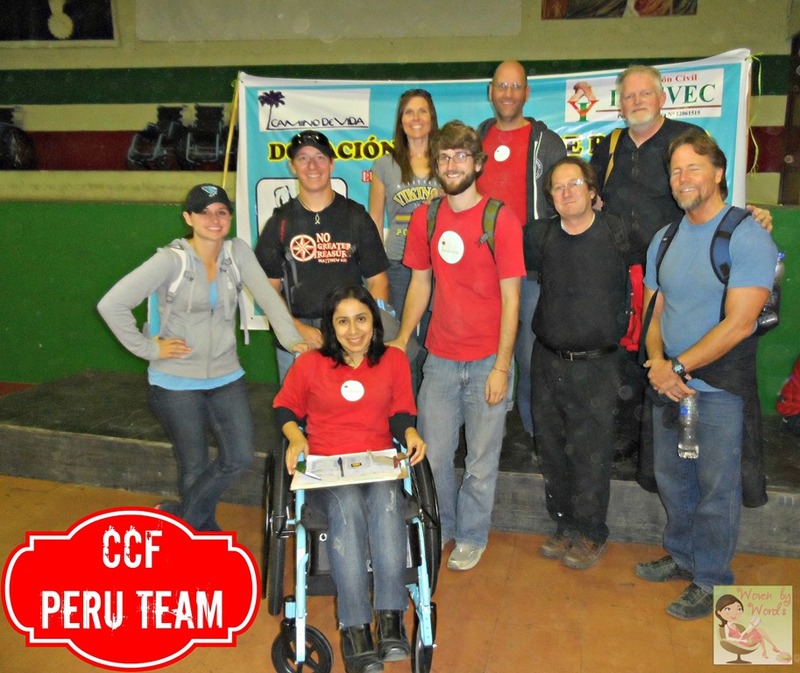 What an awesome event and story. God bless you! !